Du durchsuchst gerade das Archiv des Tags ‘Tangerine Dream’. I think it was in January that I posted a review of Edgar Froese’s autobiography here. In March 2018, a documentary on Tangerine Dream was published on DVD: Revolution Of Sound. The movie was made by Margarete Kreuzer with the help of Arte, WDR, RBB and some crowdfunding. 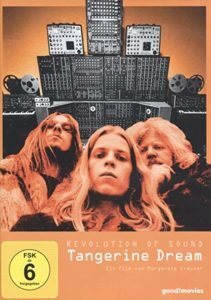 As Edgar Froese had wished, a 55-minute version was made for Arte TV, a long version (89 minutes) was made for DVD and cinema. Don’t expect any revolutionary news, but it’s an interesting trip. The docu starts with Edgar Froese, walking with a strange construction of microphones recording his breath and electrodes on his chest through obviously hot sunshine into the ocean to use the sounds and data to control a synthesizer (it’s a pity we don’t hear the result). The film then walks chronologically through the story of the band, with the focus mainly on Froese. Most of the used material was known before, like the „Bathtub Session“ or the snippets from the „scandalous“ Reims Cathedral concert, but we also get a lot of stuff here that was filmed by Froese himself — obviously this was one of his obsessions. Besides this, there are several interviews with people who were involved in the band or in projects the band had to do with. We see Brian May (guitarist of Queen who’s also an astrophysicist) who performed with TD using the sounds of radio stars. There’s Jerome Froese (son of Froese and his deceased wife Monika) who talks about playing with David Bowie’s son as a child. There are snippets of a teaching by Pierre Schaeffer, a statement by Virgin head Richard Branson, and a sort of working report by director Michael Mann about the Sorcerer soundtrack. More interesting is Jean-Michel Jarre who was in the Reims audience and in 2015 recorded a track with TD. He talks about his theory that electronic music was a French and German invention. This is for sure not wrong, but it should be said that in France and Germany „electronic music“ was a very academic thing that used technical devices that were usually not made to be used as musical instruments. The Moog Synthesizer changed that, and I think it was not by chance that this device was not a German but an American invention. But — and in this respect Jean-Michel is right — the American musicians tried to integrate the synthesizer into their rock music as a sort of interesting sounding addition, while the German musicians radically waved goodbye to their classic rock instruments and were the first to use the synthesizer as main or even only instrument. But most interesting of course are the things Peter Baumann and Johannes Schmoelling have to say because they know the real story. It becomes clear that the high time of Tangerine Dream were the 1970s and 1980s, after this the band turned out to be more and more a solo project of Froese with guest musicians. And of course we hear Froese’s famous sentence: There is no death, there is only a change in the cosmic address. Most of the commentary is from Froese’s autobiography. Originally it was planned to use statements of Froese. A lot was taped, but when the accident on black ice happened and his broken jawbone adhesed a bit awry, he had difficulties to speak. So director Margarete Kreuzer decided to use the autobiography instead, spoken by Alexander Hacke (of Einstürzende Neubauten). Bonus material has interviews with Johannes Schmoelling, Peter Baumann, Jean-Michel Jarre, Linda Spa, Michael Mann, Bianca Froese-Acquaye and Margarete Kreuzer; and two concert snippets — unfortunately from a late phase of the band with a lineup that was not that interesting anymore. I would have preferred to see some material of the „classic“ years which I’m sure exists. The DVD has the movie in a German as well as in an international version, but for some reason the region code is 2, so it might be some American DVD players and computers won’t play it.